These are the culprits that destroyed my Christmas tree. I was not able to load it up before, so now here's some pictures. 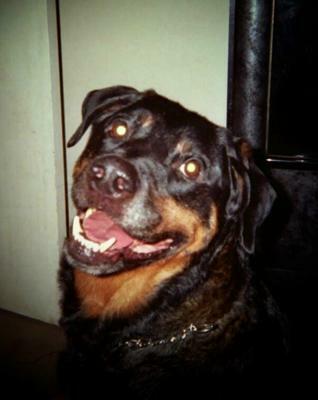 Just to let you know I lost Max at 8 yrs old due to Evans disease about 2 yr ago. I rescued Max from a neglectful and abusive home, and in less than one month he came down with Parvo. 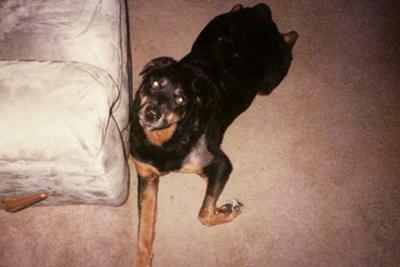 $3,000 dollars later he was the best dang Rottie anyone could have! I have a PowerPoint done of max's life story if you are interested in seeing it. Deanna, I meant to let you know also that I uploaded these 4 pictures to your "Twas the night before Christmas" story as well. Thanks so much for sharing these priceless pictures! 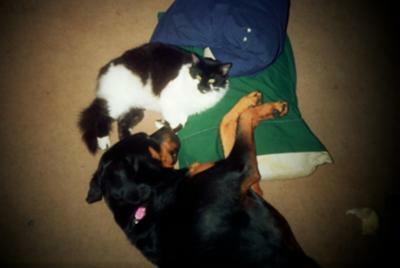 Isn't it just amazing when a dog as big and supposedly viscous as a Rottweiler can curl up next to a kitty cat? It really looks like they were best friends (and of course partners in crime - LoL). Max has that look in his eyes that say's he's a gentle soul. 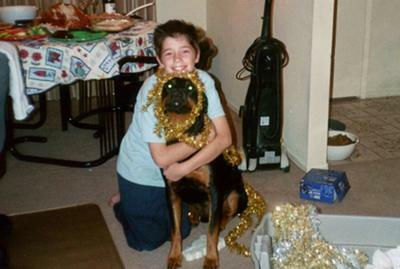 Bless you for rescuing him. . . Of course, we could argue that they actually rescued us couldn't it? He reminds me very much of my boy Chevy (he definitely rescued my hubby and me). I would love to see your PowerPoint of Max's life, that would be fantastic! With your permission, I's love to share his story with other visitors as well.